Why Free Hosting for Teachers? Teachers put so much of their time, money and effort into preparing and teaching their courses. Teachers started WH4S and we want to give something back. Hosting teaching sites for other educators is one way we try to give back. If you are an active teacher, please apply. 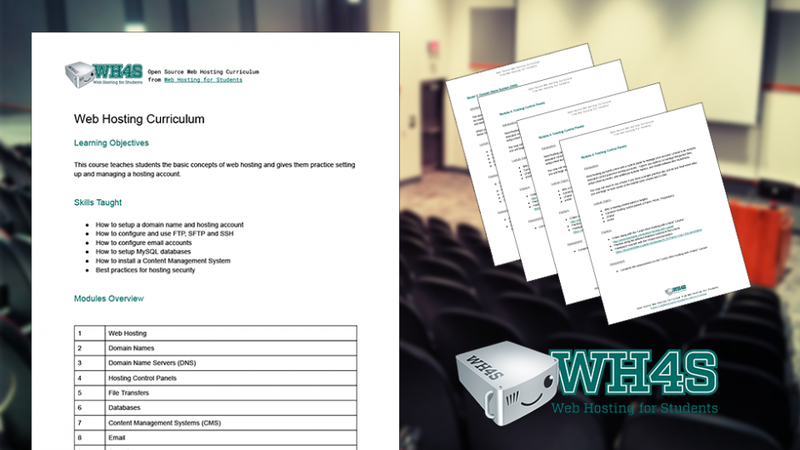 We have created a free, open source Web Hosting Course Curriculum for teachers who want to cover web hosting topics in their courses. Modules include: Web Hosting, Domain Names, DNS, Hosting Control Panels, File Transfers, Databases, CMS, Email, Security and Selling Web Hosting. Each module has an introduction, lecture topics, practice exercises and recommended assessments. We have created a number of online courses aimed to help supplement learning for both teachers or students. Feel free to use our courses to educate yourself on web hosting or to assign to your students so they make sure to learn the fundamentals. Get Your Students A Discount!!! Request one for your students or school. We would love to feature your teaching site in on our site to help promote you and your students’ work. Please submit your site for review once it is online and looking good.